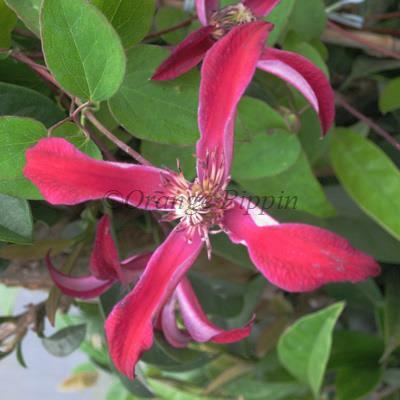 'Gravetye Beauty' is a popular example of the species Clematis texensis, named after the US state of Texas where plants of this species it can be found growing wild. It bears beautiful crimson-red flowers, which open at first with a long tulip-like or bell-like shape before eventually spreading wide open into a 4-pointed star - a characteristic of this species. Regardless of whether the flower is newly-emerged or fully open, the strong crimson colours are a particular feature. The flowers initially have red and cream centres, which change to pink as they mature from July to October. 'Gravetye Beauty' was raised by Francisque Morel of Lyon, France and given to William Robinson of Gravetye Manor, who named it after his home. Although considered to belong to the species Clematis texensis it is probably a hybrid - perhaps Clematis texensis x Clematis viticella. The significance of this is that it is very difficult to propagate varieties of Clematis texensis whereas 'Gravetye Beauty' can be reliably propagated and remain true to form. This non-evergreen climber can be grown against a trellis, garden fence, wall, arches, pillars, pergolas, clambering over tree stumps, through large shrubs in the flower border or planted in a container on the patio. It will reach a mature height of around 2m. It does best in full sun but will tolerate shade. 'Gravetye Beauty' is somewhat prone to mildew, a common characteristic of the species Clematis texensis. Good ventiliation will help control this. It also benefits from hard pruning after flowering.